However, one thing was for sure – I didn’t know how to deal with my anxiety at all. One poor grade, one awkward conversation, one “mistake” – and my self-critical mind would torture me like no other. I would worry about everything, and that was my way of motivating me to get things done. It sorta worked. I got good grades. But I wasn’t happy on the inside. I had no idea my anxious mind was running the show in the background and causing so much pain. I had heard about meditation from some other students and someone had told me it was awesome, and you could get class credit for taking the class. So on one faithful day in Berkeley, I walked into my first meditation class and sat with 50 other students and followed the guidance of the teacher. I watched my breath for 1 second. And then thousands of thoughts about what I had to do, all the awkward conversations I had, and “what the heck am I doing here?” showed up. “If thoughts arise, just return to the breath” he said. “JUST NOTICE THE THOUGHTS? But I am my thoughts!? How can I just notice them” I thought…. “And return to your breath” he said. I sat there, doing my best watching my breath, and just noticing my thoughts for the next 10 minutes or so. The energy in the room was something I had never experienced before. For some split seconds, my mind was not running the show. I was just watching it. I didn’t have to be completely run by it. I felt like I had discovered chocolate for the first time. I had a little space to breathe, for the first time. I left that first class feeling like something about me had changed. So each week I would return to the class and practice with the group. It was powerful to practice in the group and be guided by the instructor. These were the mindfulness training wheels I needed. That was about 14 years ago. And since then, each day I have sat down and just watched my mind or engaged in some mindfulness practice. And it has made a huge difference. My anxious mind is still here, but it doesn’t drive the bus anymore. I much more regularly feel a sense of ease and peace. And perhaps most importantly, I know how to return to peace and ease, when things get hard and stress and anxiety shows up. Mindfulness practices. Self-compassion practices. These have transformed my struggle with anxiety like no other. And, it is still a practice. I continue to go to groups to sit, listen to teachers to guide me, and intend to extend my mindful presence to all aspects of my life. It continues to transform me and evolve me. And I imagine it will for as long as I live. My experience of being in mindfulness meditation groups has been a powerful and transformative one. And I want to share that experience with you. 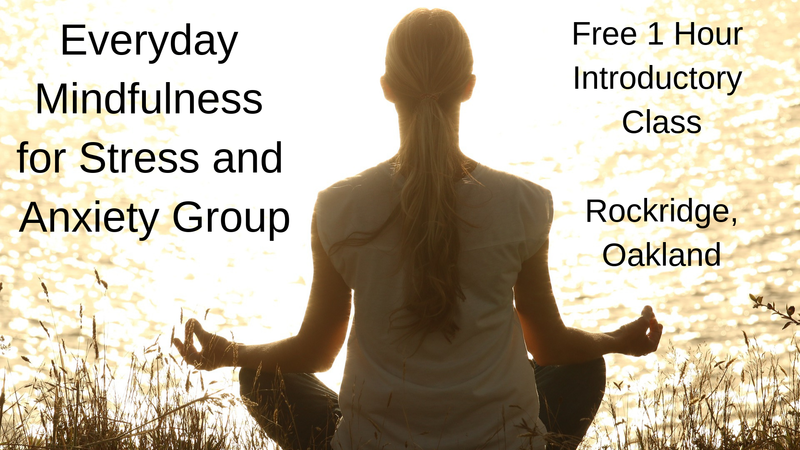 On April 18, my good friend and fellow therapist, Elana and I, will be hosting a Free Introductory Class to our 6 week Everyday Mindfulness for Stress and Anxiety Group. It will take place at 4:30pm at the Rockridge Meditation Community in Oakland. And if you know someone that could benefit from the group, please send that link to them as well. Click below to join me, and I hope to see you on April 18.